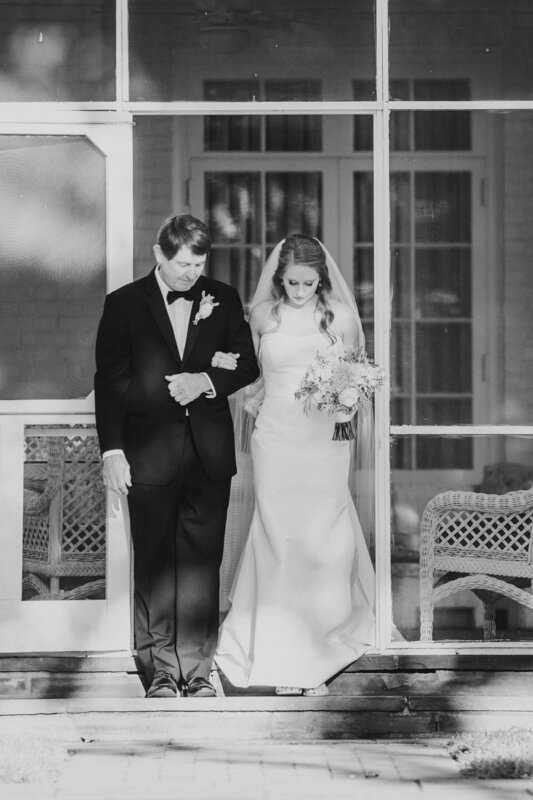 We are so excited to share some gorgeous images from Jessica's wedding this past Fall. Jessica and her fiancé, Josh, went to the same high school when they were growing up, but they actually did not know each other at the time. They met years later through mutual friends. Josh popped the question on a cruise to the Bahamas as soon as they stepped on to the ship!...a romantic beginning to what would be a beautifully romantic wedding day! 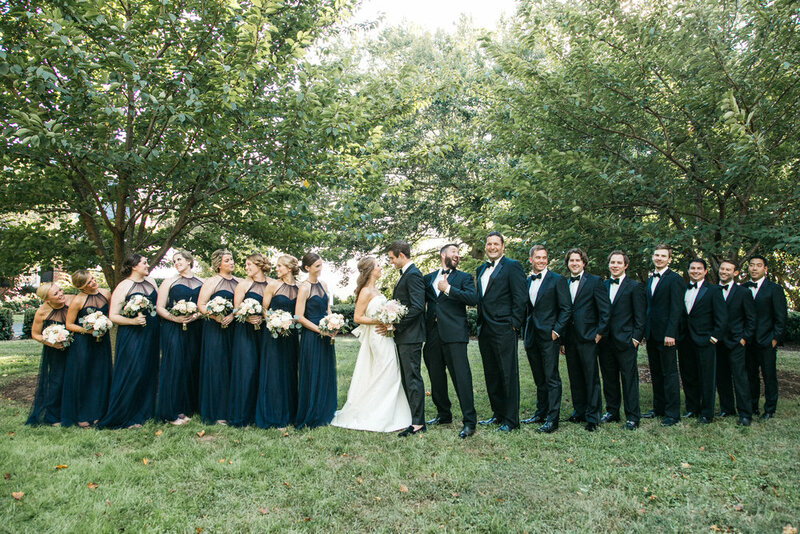 Jessica's wedding took place at the fabulous Fearrington Inn in Pittsboro , NC. 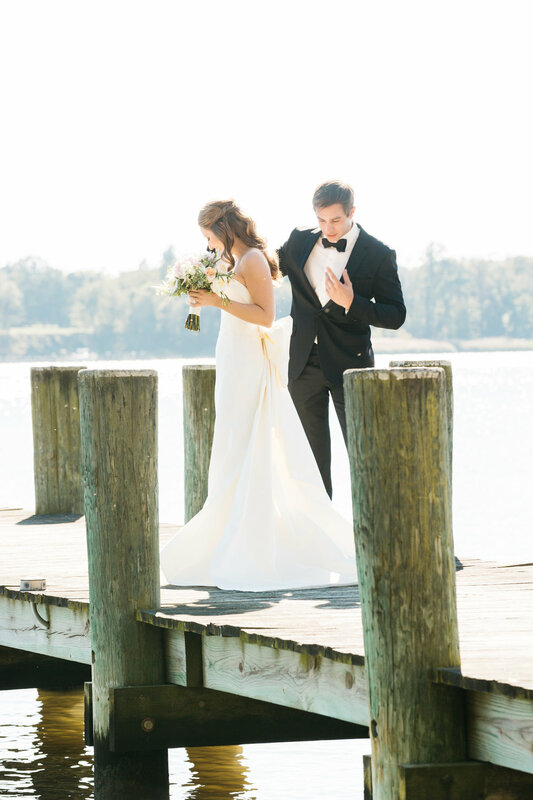 The couple did not let Hurricane Joaquin slow down their wedding day ceremony and reception! Jessica was absolutely stunning in the "Chantilly" gown by Claire Pettibone. The necessary cover of umbrellas made for amazing wedding photos, and the rain did not dampen the bride's mood at all...she looked radiant!! The reception buzzed in the rustically elegant Barn at Fearrington. The couple enjoyed dancing and celebrating with their close friends and family. What a perfect ending to a beautiful day! We wish our former Lana Addison manager much happiness in her marriage! May Jessica and Josh's life together be as blessed as their picture perfect wedding day! Stephanie first met her husband, Daniel, seven years ago. The two both work in the music and creative industry in Nashville focusing on photography, video, and film production. Stephanie has been playing the violin since she was six and loves the symphony, so it was only fitting that Daniel proposed to her under the downtown Nashville skyline prior to a Dvořák performance by the Nashville Symphony. 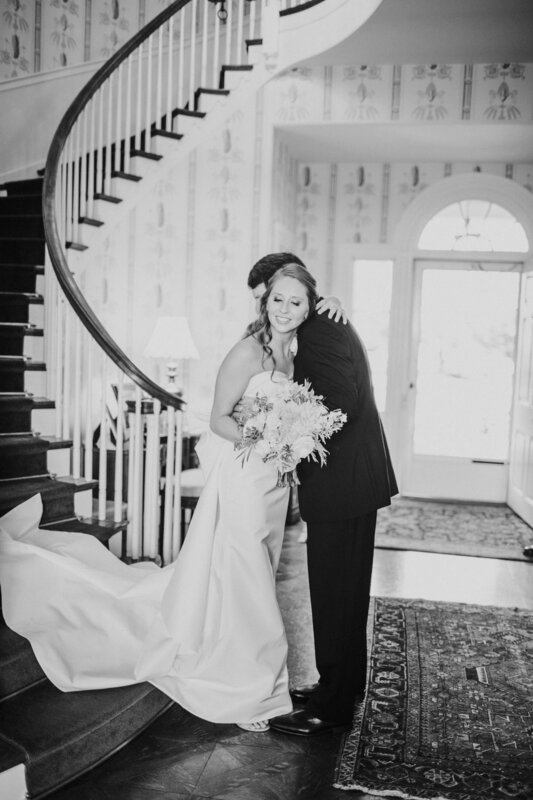 Since Stephanie lived in Nashville, she always thought that she would find her gown at one of the local boutiques, because her photography work had provided her the opportunity to shoot many weddings in the area. She first learned of Alexia's when she came across their Instagram page and had been following the boutique for some time. Stephanie decided to visit her Mom, who lives in the Triangle area, to inform her of the exciting engagement news. At the last minute, Stephanie decided to setup an appointment at Alexia's so that she could include her Mom in her gown shopping experience. 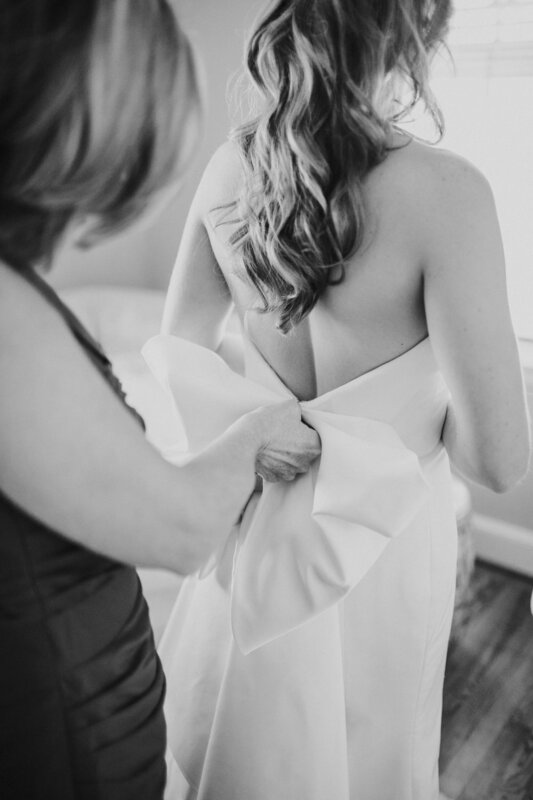 The bohemian, flowy style of wedding gowns is very popular in Nashville, so Stephanie originally started by trying on gown after gown in this theme. Her Mom, however, was not in complete agreement and thought the dresses just didn't suit Stephanie and her wedding. 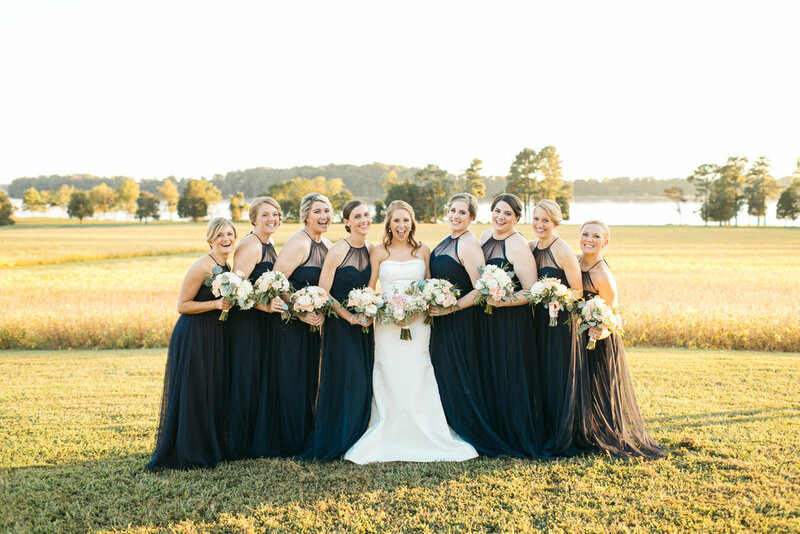 Stephanie's consultant worked hard to find a balance and realized that she was a “romantic, edgy” bride who needed something that balanced her personality, but was not too formal. The “Tompkins Square” gown by Lela Rose was then selected for Stephanie, and she instantly realized it was “the one”. The dress is a fitted trumpet gown with an open illussion lace neckline and back. The look was complimented by a simple veil by Vera Wang that did not distract from the unqiue detail of the gown. Stephanie and Daniel had an amazing champagne brunch wedding in the Spring with all of their loved friends and family; and at the end of their wedding, they drove off on Daniel's motorcycle!